Representative Honours: Ireland: 2 Full Caps (1931-1932). 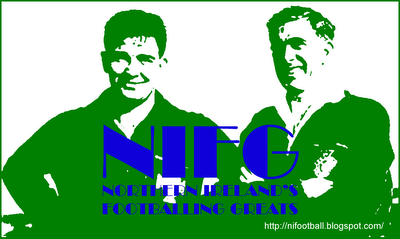 Club Honours: (with Aberdeen) Scottish Cup Runner-Up 1936/37; (with Clyde) Scottish Cup Winner 1938/39. 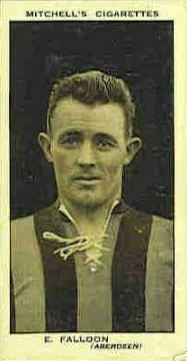 The diminutive Eddie Falloon played intermediate football with Crusaders before moving to Scotland where he signed for Aberdeen in the 1927/28 season. Initially he played more as a forward and in 1932 in an 8-2 win over Falkirk with Dubliner Paddy Moore claiming a double hattrick. Through his career Falloon dropped back to play in the half-back line where he became noted as "one of the smallest centre-halves in the Don's history (who) compensated with a fierce commitment and desire." He captained Aberdeen in their 1937 Scottish Cup Final defeat by Celtic before moving on to Clyde in January 1938. Falloon had a little more luck in his second Scottish Cup Final in 1939 when, with another Irishman Ned Weir at left-half, Clyde defeated Motherwell 4-0. On the outbreak of World War Two Falloon played the only Irish League football of his career with hometown club, Larne. He then finished his near-twenty-year career back with Crusaders, where it had all began. Capped twice by Ireland, Falloon's first appearance saw an Irish team robbed of all their English-based players achieve a 0-0 draw against Scotland at Windsor Park - a result with which the were "well satisfied". Against an accomplished Scots back-line Falloon, at inside-right, put in a "clever" performance, but in reality the Irish could do little to dent the Scottish rearguard. It was to be a year-and-a-half before Falloon again took to the field for an international match, once again the venue was Windsor and the opponents Scotland, the difference however was the final result and his role as right-half. As the Scots ran out easy 4-0 winners the papers picked on Falloon, along with centre-half Jack Jones and left-half Bill Gowdy, as "not up to international standard". Also a keen cricketer, Falloon returned to Ireland during the War.